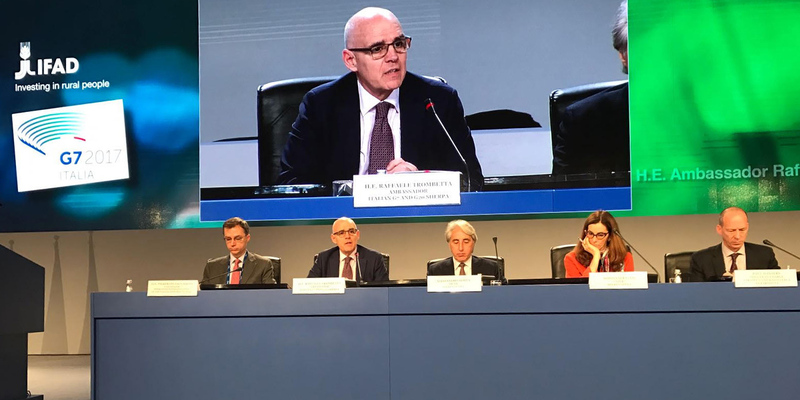 On February 13th, Ambassador Raffaele Trombetta, the Italian G7 Sherpa, attended the annual Governing Council of the International Fund for Agricultural Development (IFAD) where he outlined the Italian G7 Presidency’s agenda. Innovation, skills and labor in the age of the New Production Revolution. In this context, the Ambassador highlighted the importance of the food security and nutrition issue. The 2017 G7 approach is in line with Italy’s specific attention to these matters since the L’Aquila Food Security Initiative, launched during the G8 in 2009, and with the more recent Milan Expo 2015. Furthermore, Italy has a central role as an international hub for food security as it hosts the three Rome-based UN agencies in charge of these issues. The presentation was attended by Member States, by Ambassador Pierfrancesco Sacco, Permanent Representative of the Italian Republic to the UN Agencies in Rome, by Alessandro Motta, Head of the G7 Sherpa Office and by Simona Seravesi and Paolo Verdone, Experts on Food Security and Nutrition at the G7 Sherpa Unit. Paul Winters, Director of Research and Impact Assessment as well as Officer-in-charge of the Strategy and Knowledge Department at IFAD, moderated the session.